Steve McQueen’s Widows is a hugely entertaining, violent, female-centred heist thriller that starts with a bang and never lets up. It has tension, surprises and multiple twists and turns thanks to co-screenwriter Gone Girl’s Gillian Lynn’s reimagination of Lynda LaPlante’s 1983 TV series. A strong performance by a magnificent Viola Davis as Veronica Rawlins holds the churning plot together. Her husband Harry (Liam Neeson) was an old-school career criminal – big time. But as the film starts, he and his gang members are killed in a spectacularly thwarted attempt to steal $2 million, leaving their four wives widows. The cash belonged to Jamal Manning (Brian Tyree Henry), aiming to be the first black alderman in the run-down Chicago 18th precinct and it was intended to finance his electoral campaign. He’s backed by his enforcer brother Jatemme Manning (a brutally sociopathic Daniel Kaluuya, Get Back). As the dollar bills were burnt up in the failed raid, Jamal gives Veronica a month to pay Harry’s ‘debt’ back or she’s dead. When she discovers Harry’s notebook with detailed plans for heists that he’s meticulously researched, she sees a way out by recruiting the widows of the men in Harry’s gang to help her commit a $5 million robbery that will solve their problems. It will pay back Jamal and they can share the balance. Two of them take up the challenge – Linda (Michelle Rodriguez) and Alice (Elizabeth Debicki). None of the wives is a criminal, they’ve all been struggling to survive in their own way in their different marriages and now all of them, including Viola, are also struggling with different kinds of grief. But they’ve all been threatened, have nothing to lose and self-respect to gain. Linda’s babysitter Belle (Cynthia Erivo) later joins them. What gives Widows its initial visual spin on powerful women is that their first meeting takes place in a uniquely female space – in a spa, in the sauna – that highlights the difference between women and men behaving badly. Viola is always dressed in stylish black and white and accompanied by her fluffy white bichon frisé, which turns out to be more than an ultra-feminine accessory. The shift of the original setting from London to Chicago broadens out the story from a pure crime caper into a commentary on the state of America, its political corruption and its poisonous race relations – we see the deadly results of the crime of ‘driving whilst black’. Whilst this is implicit in robbery, Widows makes social and economic inequality and the gulf between rich and poor an explicit strand in the film. Unlike the tenements of the precinct and the numerous congregations of the black churches there, Jamal’s rival candidate Jack Mulligan (a JFK-like Colin Farrell) comes from an ivy-clad background of wealth and privilege that’s just a car ride of a few streets away. He’s bolstered by a sense of entitlement comes from being part of a local political dynasty, and the expectation that he’s the rightful inheritor of that public office, and eventually becoming mayor, on the retirement of his alderman father (Robert Duvall). Director Steve McQueen (Twelve Years a Slave expertly handles multiple action sequences and the film is fast moving and full of surprises that make you gasp from beginning to end – and so engrossing that it doesn’t really matter that it glides over a few plot holes and practical details. We don’t see too much of the women’s preparations and training for the heist they plan, though it must have been difficult to learn new skills, and the heist itself can get overshadowed by the complexities of the simultaneous plot strands of electoral corruption and racial politics. But what underpins the flamboyant action and the dialogue that zips along is Widows‘ underlying study of grief and female solidarity and empowerment. Alice in particular has an intiguing character development arc. And it demonstrates the truism that men and women use crime in very different ways and for very different purposes. 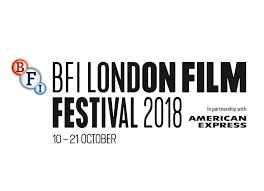 Widows has its international premiere at the BFI London Film Festival on 10 October 2018 and also screens on 11 and 12 October 2018. It’s on release on 6 November 2018 in the UK.